They’ve given you gifts for your little one on the way, saving you money and stress. Now that you have clothes, diapers, and toys for baby when they get here, what will you do to thank the people who assisted you in this preparation? Give them an amazing card, of course. Now comes the tricky part. What should the message say? What do you write in a card that is meant to help you say thank you to some of your dearest friends and family for the gift they have given to you and your new bundle of joy? In the below categories you are guaranteed to find just the right message to put in your thank you cards that will blow their minds, touch their hearts, and bring them a little happiness when they look back on what they have done for your child. Whether this is your first child or not, every little bit of help you can get is precious and counts for a lot. If it isn’t your first you know even more how much help you’re going to need. Give them the card that shows them you know what they’ve done and how appreciative you are by giving them a religious or heart-warming card. If you’re having multiples, there are messages in these categories to recognize double the amount of help as well. Put a funny message in your thank you cards to make them laugh and bring smiles to their faces when they look at your child and when they remember what they did for your family. These messages are perfect for the soon-to-be parents who want to bring their child into a loving, religious home and want everyone they love to know they’re thankful for what they have done for this new little blessing. “Children are a heritage from the LORD, offspring a reward from him. Like arrows in the hands of a warrior are children born in one’s youth. Blessed is the man whose quiver is full of them. They will not be put to shame when they contend with their opponents in court. Psalm 127:3-5” Thank you for joining us in the celebration of our new blessing. “Start children off on the way they should go, and even when they are old they will not turn from it. Proverbs 22:6” Thank you for helping us start our little one on the right path. “For you created my inmost being; you knit me together in my mother’s womb. I praise you because I am fearfully and wonderfully made; your works are wonderful, I know that full well. My frame was not hidden from you when I was made in the secret place, when I was woven together in the depths of the earth. Your eyes saw my unformed body; all the days ordained for me were written in your book before one of them came to be. Psalm 139:13-16” Got already knows our child. We can’t wait to introduce them to you. Thank you. 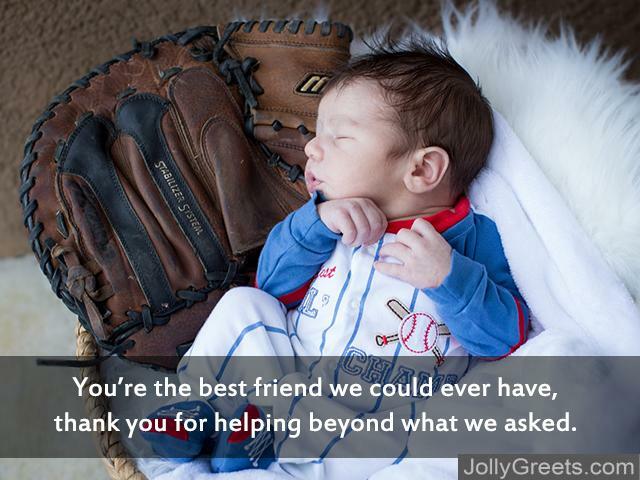 A card category to help you thank those special people in your life who have gone above and beyond to help you start your new family off right. Show them you care and appreciate it by giving an adorable and heart-felt card that shows you think they’re a very special person and you want them to be involved in your new child’s life. 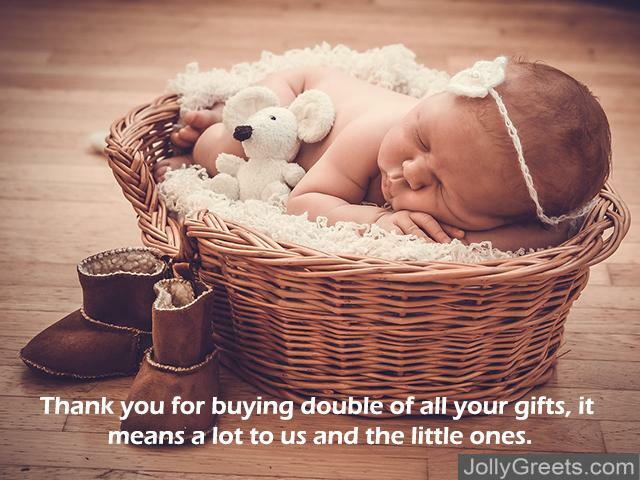 (Having twins) Thank you for buying double of all your gifts, it means a lot to us and the little ones. Extra baby hugs when the cutie gets here! Thank you so much! The little one thanks you for helping us provide the amazing life our child deserves. Thank you for sharing in this special day, thank you for helping in this special way. You’re the best friend we could ever have, thank you for helping beyond what we asked. We could never ask for a better friend than you. You have brought so much joy to our new family. These messages will make your friends and family laugh and smile when they think of you and your child. If you’re the type of couple who joke with your friends and family constantly and can always be depended on to make others laugh, then this category is for you. Bring your child into this world and start your family off right, by bringing a little laughter and joy to those around you. Don’t worry about forgetting a gift. Your gift will be babysitting for 18 years. Oh, you brought a gift? So, no babysitting? A new parent can’t be a quitter. But we can, because we have the best ever babysitter. Thank you for watching the baby! Diapers and bottles and late-night hours, but on the bright side, our best friends threw us the best baby shower. Look forward to your next kid, because we’re regifting the gift you brought. You’re the best friend in the world, thank you so much for the 8th stroller today! (For new grandparents) Just remember, if you get us a noisy toy we’re going to send the baby and the toy to your house on the weekends.